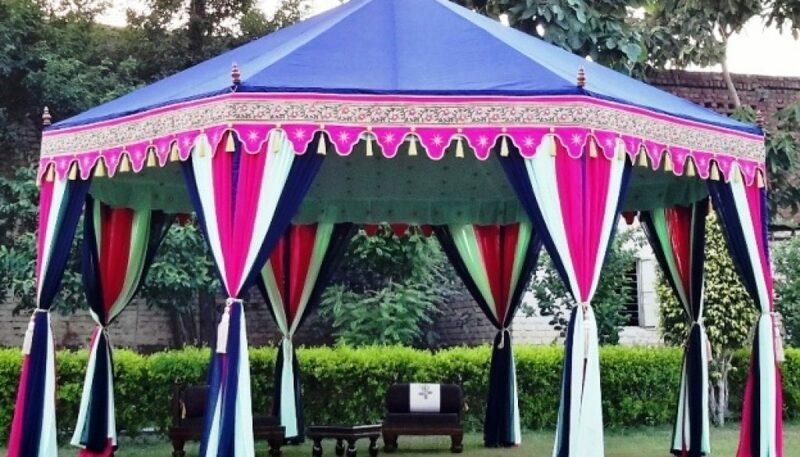 The Bride and Groom Tent is a very personal affair in a Wedding. 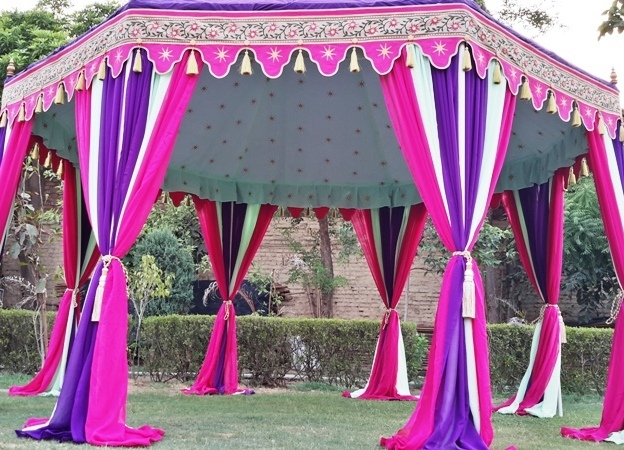 A Grand Pavilion make a big statement in front of your wedding guests. 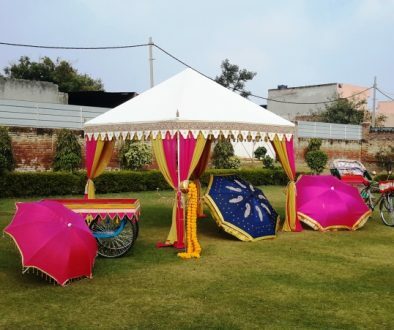 It adds an extra elegance and high class element to the wedding. 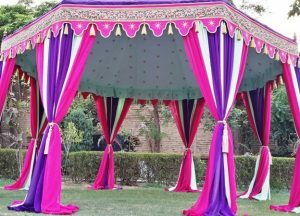 For a personal touch, contact us to Customize your Wedding Tent according to your wedding theme colors and make it look one with your entire set up. 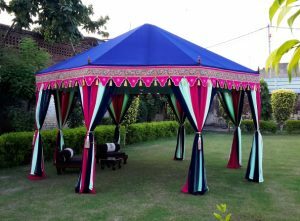 This 16 ft diameter Octagon Tent is made of Blue color Canvas that is water proof and rot resistant to last longer. 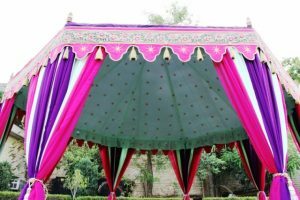 The Sheer drapes are tied with superior quality tassels and tie backs to cover the poles and create gateways from all sides of this grand Octagon Pavilion. 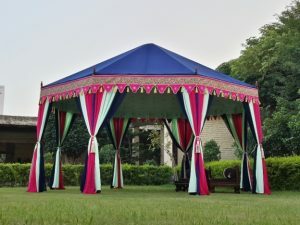 This 8 – sided Frame Tent is erected on a folding metal pipe frame and sockets. Each standing pole has a base plate at the bottom, for more stability. 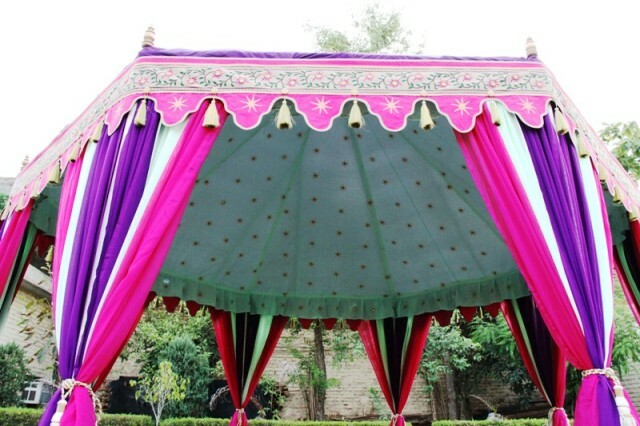 This Frame Round Tent can be erected in hotel lawns and gardens for parties and weddings. This Indian Tent can also be erected Indoors, on concrete and tiled floor, to transform Ballrooms and Hotel Lobbies for parties and events. 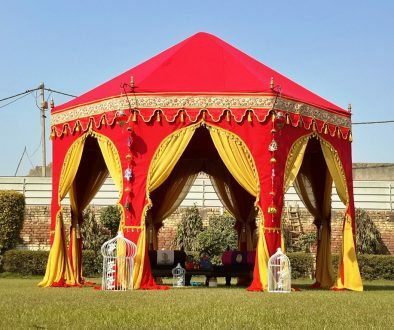 This beautiful Octagon Tent is used as an Indian Wedding Tent, Event Tent, Garden Gazebo, Ceremony Tent, Personal Cabana, Arabian Theme Party Tent, Lounge Tent and Moroccan Theme Party Tent. 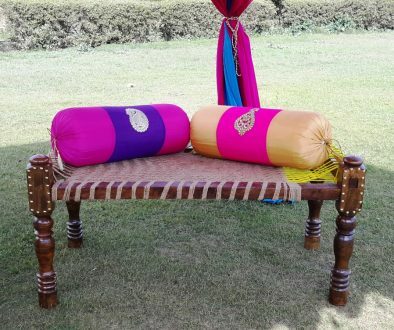 The Inner prints can also be customized according to your choice of colors and patterns.for more options on Prints and Colors, Click Here.